Music Finder is an integral part of all Tyros keyboards. 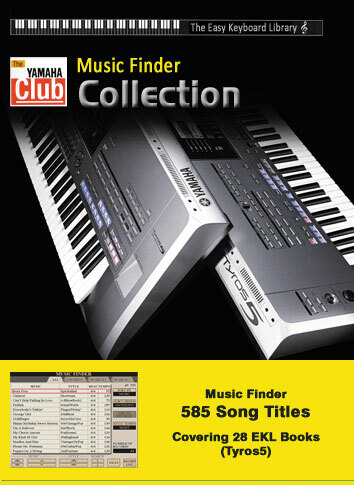 This collection provides style and voice settings for 585 songs from the popular Easy Keyboard Library series of music books. ​The collection can also be appended to your existing Music Finder list (as long as the combined list doesn't exceed the maximum 2500 titles allowed in the Music Finder system). Please note that this software does not include new styles or voice samples. * The content of each book listed here is also available to download individually from our website should you not wish to purchase the full set. Buying the collection, however, represents a significant saving against the cost of the same number of files downloaded individually.